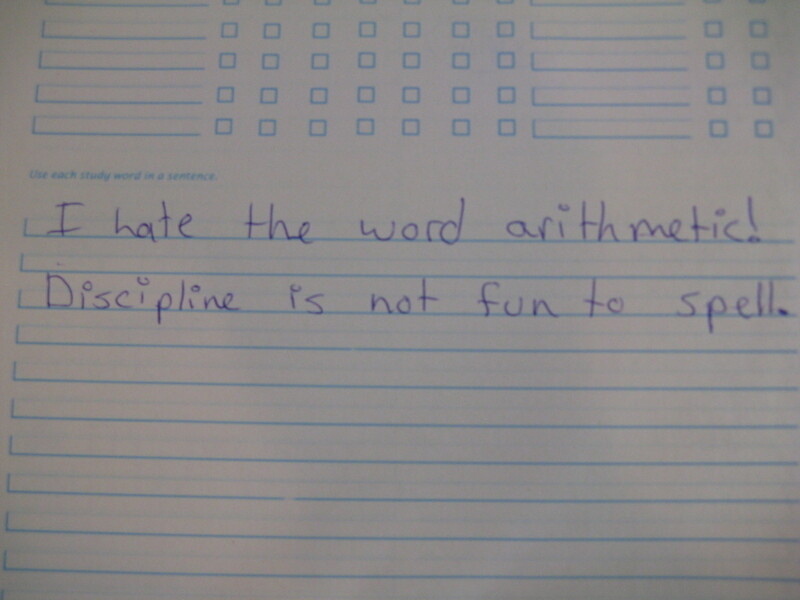 Discipline is not fun! The example above shows just what my daughter thought about having to practice her spelling words and then use them in a sentence. She became especially frustrated if she missed the same word several days in a row and had to go through the practice exercises. 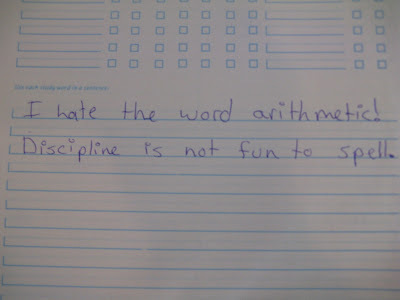 I thought of this discipline as a training technique to improve and develop her spelling skills and character. My daughter viewed it as punishment for being young enough that she was forced to learn to spell words and live up to adult expectations for her education. How many of you teachers and parents would give in to your child at this point and not push them further? No one? That’s what I thought. We push our kids to greater levels of achievement, not out of some malicious sense of payback for what we endured as children but because we know that giving up is rarely helpful. Learning to stick with a task, even one that is hated or just not fun, is something that everyone must come to terms with sooner or later. As adults we understand that hitting the wall a few times until we accomplish something makes the success all the sweeter. Likewise, giving up leaves a lingering sense of failure that is hard to eradicate. In the example portrayed above, you probably noticed an unenthusiatic attitude about doing schoolwork. I did talk to my daughter both about the need to persevere and the need for self discipline. These two things generalize far beyond the academic realm and into many aspects of everyday life. As I talked with my daughter, I tried to help her see that working at mundane tasks was just a part of everyday life. As a child, it might include her school work and chores. As an adult, it would encompass caring for a home and completing whatever work she had committed to do. Here’s the rub: if a person does not learn to discipline himself or herself, there will be others who will gladly discipline them. If you don’t like being told what to do, don’t wait when you see something that needs to be done. Take initiative, and no one will have to tell you what to do because you’ve already taken care of it. Learn to think for yourself and develop your own convictions, because if you don’t there will be plenty of people who will gladly tell you what to think and how to act on their beliefs.